This wide-screen, curved all-in-one has what it takes for gaming. 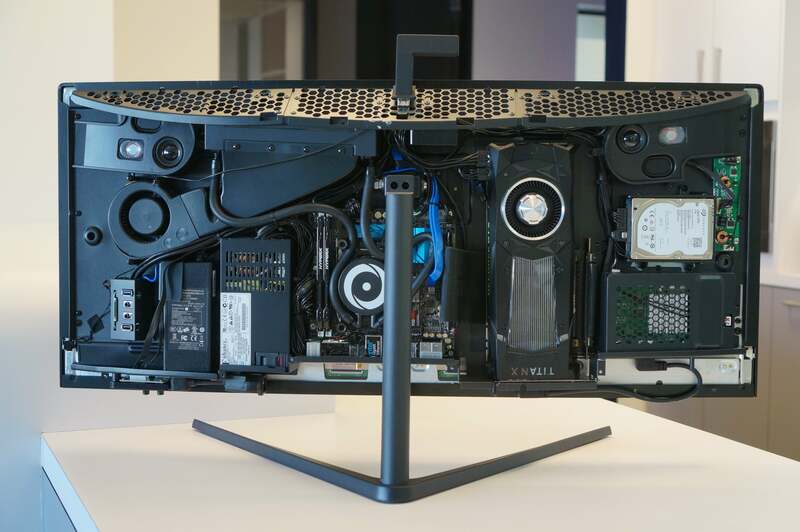 The Origin Omni all-in-one PC packs an 8-core Core i7 CPU and the mighty Titan X Pascal. Let’s be honest, all-in-one PCs have always been a pretty compromised lot, sacrificing performance for a sleek, compact form factor. Sure, you get a clutter- and wire-free work area, but the internals are usually a disappointing collection of underpowered parts. And getting inside that AiO to service or upgrade it? It would be easier to stroll into the iPhone prototype room at Apple HQ wearing a Samsung shirt. Origin PC’s Omni defies that stereotype. It’s so powerfully over-the-top and tinkerer-friendly that it’s the rare breed of AiO that enthusiasts can take seriously. Unlike most AiO’s, it’s easy to get inside the Omni. On the surface, the Omni’s 34-inch curved enclosure doesn’t look much thicker than a standard wide-aspect curved monitor. But inside, the Omni packs some serious computing muscle. We’re talking full-tilt, overclockable, high-performance desktop components. Origin sells the Omni with options for Intel’s Skylake chips up to a Core i7-6700K. If that’s still too tame, there’s an option for Intel’s Broadwell-E, even the 10-core chip. GPU options also run the gamut from mid- to high-range. For our review unit, Origin selected “high” and packed the Omni with Intel’s new Broadwell-E 8-core Core i7-6900K and Nvidia’s mighty Titan X Pascal. That’s pretty much top-of-the-line performance for graphics and almost top-tier for CPU. For storage, our review sample featured a 512GB M.2 Samsung 950 Pro drive and a 1TB Seagate hard drive. There’s actually room for two 2.5-inch drives if you need more storage capacity. 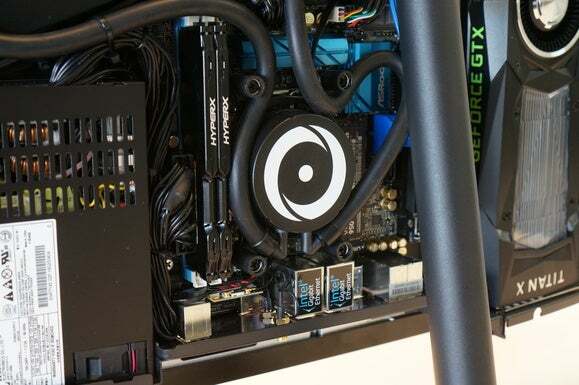 The CPU itself is liquid-cooled using a unique custom closed-loop cooler. Our unit, though, exhibited a rather loud gurgle and slurp when first powered on. 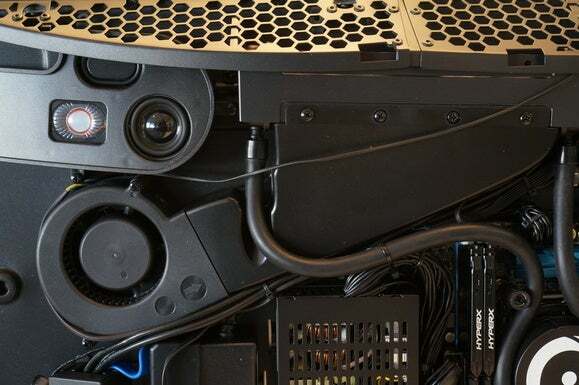 The blower and radiator for the cooling is clearly custom-built to fit only the Omni. The power setup for the Omni is pretty clever. Two power bricks feed the system (one for the PC and one for the monitor), but instead of requiring two power cables, a pass-through cable feeds both. I’m a bit concerned, however, about the amount of power available to the Omni. The PC’s PSU is rated at 450 watts. Nvidia says the Titan X Pascal is a 250-watt card and recommends no less than a 600-watt PSU. Granted, that’s in a standard desktop, which could have a lot more hardware to feed than an AiO. To find out how much power the Omni uses at the wall, I disconnected power to the display and then plugged the PC into a watt meter. I measured consumption at 400 watts while gaming—that’s not a lot of headroom in my book but Origin obviously thinks it’s fine. There are two power bricks in the Omni (one for the panel and one for the PC) but a clever pass-through cable eliminates the need for two power cords. While most all-in-ones discourage tinkering by making access to the internals very difficult, the Omni takes the opposite tack. A few screws on the bottom of the enclosure and a few screws up top are the only things standing between you and pretty much all of the Omni’s parts. With the back removed, you have ready access to the CPU, storage, RAM, and—the real bonus—GPU. Typically, AiOs use mobile graphics parts soldered to the motherboard, or MXM modules that are often proprietary designs. But the standard desktop GPU inside the Omni is held into place with just four screws, making it easily swappable. The price you pay for that easy upgrade is funky cabling. In a typical all-in-one, the display is connected to the graphics card using an internal (and delicate) ribbon cable. 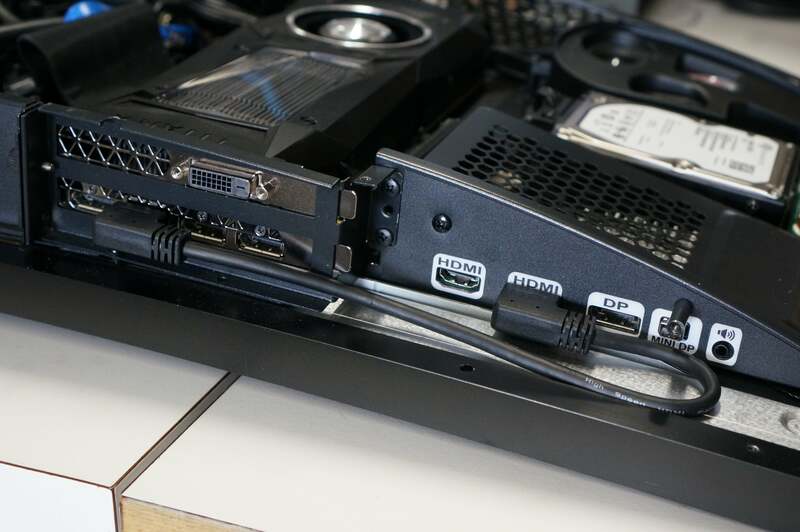 Since the Omni uses a standard, replaceable GPU, a short, visible cable runs from the Titan X’s HDMI port to the screen. That’s practically tantamount to using duct tape and a rubber band in the buttoned-up world of AiO systems. Still, you have to admit that the flexibility is worth the trade-off in looks. The Omni’s panel offers HDMI, DisplayPort, and Mini DisplayPort inputs—a typical AiO offers just one HDMI input and maybe one output. Since the GPU is stock, you get to take advantage of all its outputs. On the Titan X, for example, you have three DisplayPort and one HDMI. You could (if you switched out the angled HDMI cable) power up to three external displays with the Omni. 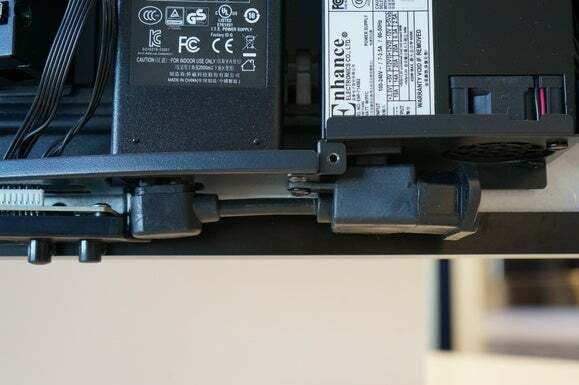 Most all-In-one designs use delicate internal ribbon cables to connect the GPU to the panel, which makes for cleaner wiring but a lot less upgrading flexibility. If you’ve been paying attention to the pictures, you might get the feeling that the the Omni design started with an ultra-thin panel that was cleverly modified into a fully functional PC by tacking on parts behind a curved piece of black plastic. That’s certainly the impression I got after seeing the less-than-elegant pass-through cables and external power brick tucked inside. No, this is no ultra-thin iMac or Asus Zen. But as someone who likes industry-standard parts and easy access, I’ll take crude over elegance. The Omni’s foundation looks to be a bone-stock Asrock X99E-ITX/ac motherboard, which implies it’s easy to remove and upgrade. The ports at the bottom of the mobo are exposed at the bottom. Although the hardware and ease of access are impressive, one of the most disappointing features of the Omni is something that can’t be replaced: the screen. The curved 34-inch 3440x1440-resolution PVA panel is just plain blah. The curve itself is relatively slight, especially compared to, say, the Acer Predator Z35 monitor. While off-axis viewing on the Omni is okay, the contrast doesn’t really pop on the screen, which features a slight anti-glare coating. Is it a deal breaker? Probably not. But when you get the world’s fastest GPU with an 8-core monster CPU, you expect a screen that’s equally dazzling. 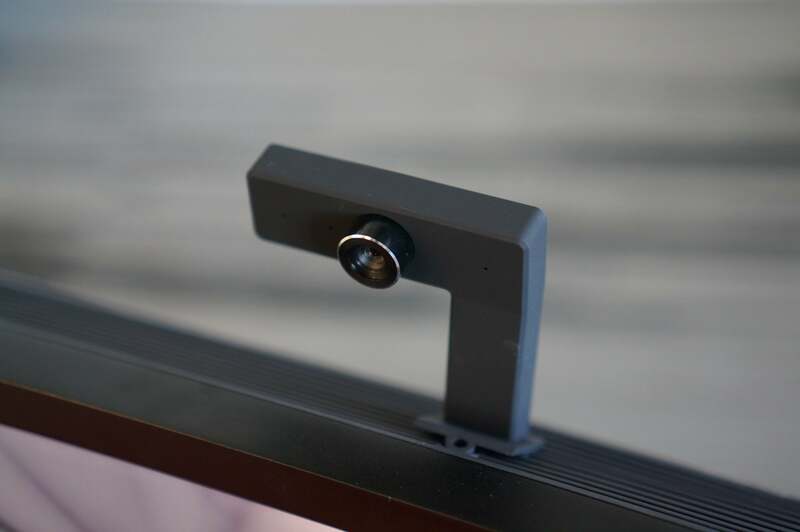 The webcam plugs into an open USB port on the top of the Omni. Although this unit did not feature it, the company has plans to offer an Intel RealSense version. There’s a reason Nvidia charges $1,200 for the Titan X Pascal—it’s that fast. 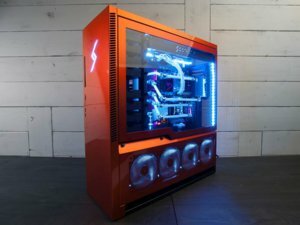 Origin makes it even faster in the Omni by overclocking the GPU. 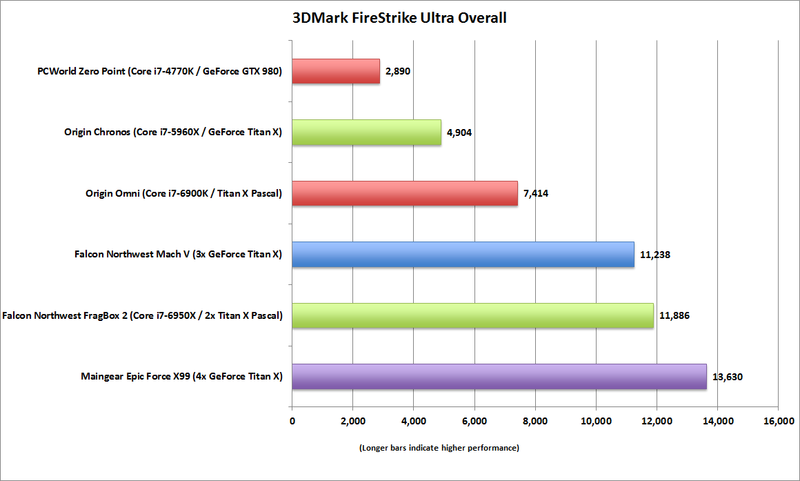 In the synthetic graphics test 3DMark FireStrike Ultra you can see how much faster the new Titan X is than the older, err, Titan X. The only desktop systems faster than the Omni—and I’m talking big phat towers—pack multiple GPUs to get the job done. For an all-in-one, this thing is speedy. The single Titan X Pascal in the Omni doesn’t disappoint in performance. 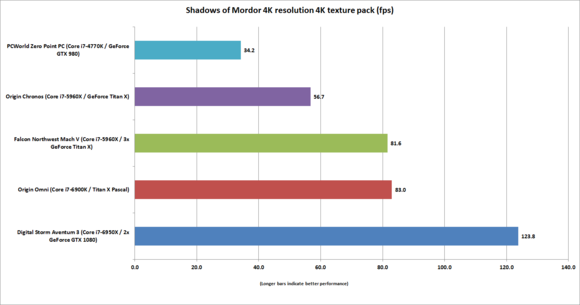 To see how the Omni stacks up at 4K resolution gaming, I plugged in an external Ultra HD 4K panel and ran Middle-earth: Shadows of Mordor with the 4K texture pack installed on the Ultra preset. The overclocked Omni easily steps away from all other single-GPU systems we’ve tested and, once again, is only overtaken by a rig with multiple GPUs. Interestingly, the Omni even beats a Falcon Northwest box with three of the now-obsolete original GeForce Titan X cards. Because the Falcon’s scores are from an earlier time, its loss could be due to older drivers and a lack of proper SLI support in Shadows of Mordor, but it’s still impressive to see a single Titan X Pascal cough up scores equal to that of a system with three earlier Titan X cards. And no, I didn’t include the gaming performance of any recent all-in-one PCs we’ve reviewed because there’s just no point—they’re not in the same class as the Omni. Since most people won’t actually use the Omni with an external panel, I also ran it at its native 3440x1440, and the results there were peppy as well. The Omni pushes 105.5fps in Middle-earth at its native resolution. It will also run Tomb Raider on the Ultimate preset at 139.3fps and Rise of the Tomb Raider at 99.6fps. The upshot is that no games out today will drag the Omni nor the Titan X Pascal down to console-like frame rates. Frankly, the Titan X Pascal is almost too much card for the Omni. I think a GeForce GTX 1080 or even a GeForce GTX 1070 might be a better fit for this resolution. The Origin Omni’s Titan X Pascal gave us equal performance to a system that packed three GeForce Titan X cards last year. Moving on to CPU performance, I ran our Handbrake encoding test, which takes a 30GB 1080p video file and converts it using the Android Tablet preset. The task loves CPU cores and threads and the Omni’s octo-core eats the quad-cores’ lunch. 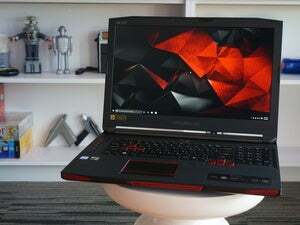 Against some other PCs, however, it doesn’t turn in the performance I expected. 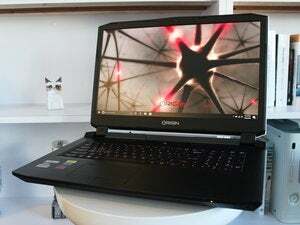 For example, the Origin Chronos, a small form factor PC reviewed here, has an older 8-core Haswell-E CPU yet outperforms the Omni by a good margin. The reason is overclocking. The Chronos' Core i7-5960X is overclocked to 4.4GHz while the Omni’s Core i7-6900K is running at a stock 3.5GHz during the encode. Why no overclock? The reason could be anything from not enough time to properly vet in our unit to just not being possible (perhaps because of the power requirements). 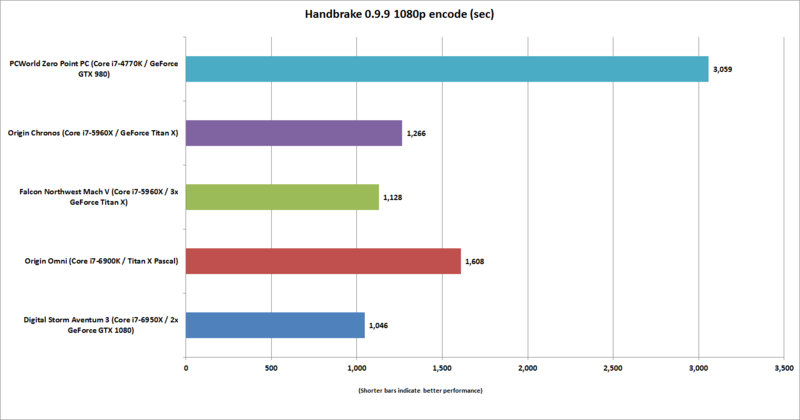 All I know is a stock 8-core chip is plenty fast (as you can tell by comparing the Omni to our quad-core PCWorld Zero Point build in the chart below)—it's just not the fastest in town. The Origin Omni’s stock-clock Core i7-6900K has a tough time against systems with overclocked CPUs. With great power comes great thermals. It’s worth noting just how much heat the Omni, or more precisely, the Titan X Pascal, puts out. To make matters worse, the GPU is mounted vertically with the heat exhaust aimed directly onto the desk in front of you. 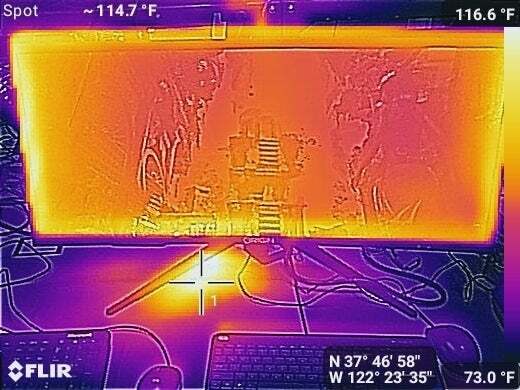 After looping Tomb Raider for an hour or so, I measured the temperature of the desk behind of the keyboard at 114.7 degrees. That’s of no serious risk to anything, unless your desktop is made of butter, but it can make your work area very warm. With great thermals comes great fan noise, too. Wind up the Titan X Pascal for a couple of hours and you’ll be listening to a borderline offensive din. The Titan X runs cooler, and thus quieter, if you pop off the Omni's back to allow more airflow across the card. Either that, or back down the overclock on the GPU (or run a less ambitious graphics card). The Titan X Pascal puts out some heat which ends up behind your keyboard. The Core i7 in the Omni runs $1,100 and the Titan X Pascal has a price tag of $1,200. That’s just two components, so the Omni's price of $5,220 as configured doesn't seem all that shocking. Still, it's one of the most expensive all-in-one PCs around. To be fair, it’s also one of the most powerful. And that’s ultimately what any potential buyer will have to weigh in his or her decision: Do you want an all-in-one that’s beautifully sleek and less expensive, but far slower and nigh impossible to upgrade? Or do you want an all-in-one that truly offers desktop-class performance with actual upgrade options? If you're inclined toward the latter, the Omni is the clear choice. Forget all your notions about all-in-ones. 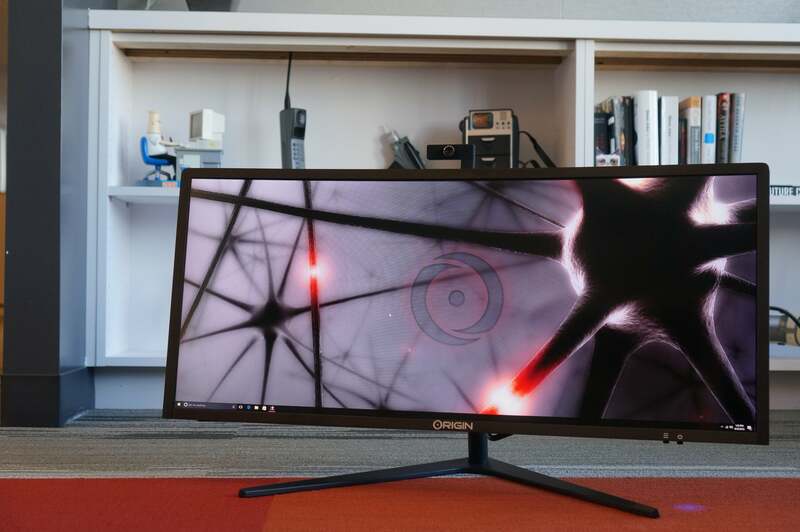 The Origin Omni has the power of full-on desktop rigs, while minimizing desktop clutter.